Ansys HFSS delivers 3-D full-wave accuracy for components to enable RF and high-speed design. Many times, HFSS needs High Performance Computing (HPC) infrastructure for complex problems. This blog post presents the performance of projects executed on Ansys HFSS using SyncHPC. 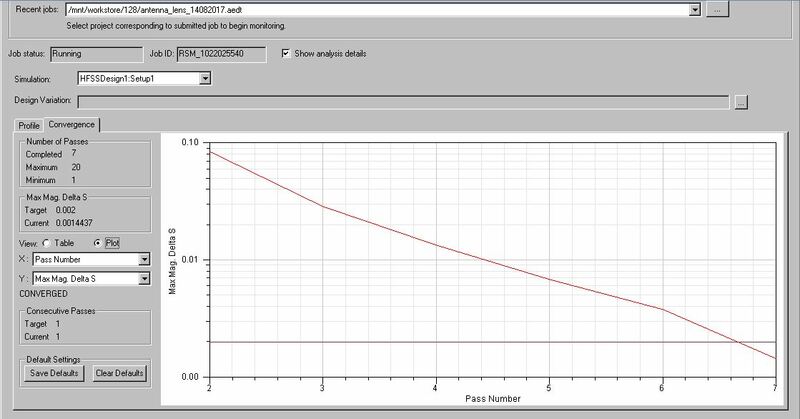 In this experiment, team tried to design and analyze printed slotted antenna with dielectric hyperboloid lens. Selected project is configured to be solved by “Direct solver”. A single machine with 128GB RAM could not start the HFSS solver on Single CPU core. The same project is successfully converged on SyncHPC based HPC cluster with each node with 224GB RAM. Even with 8 x 112GB memory, an error occurred at 5th Adaptive pass. The error was due to insufficient memory. Team changed the configuration to 224GB per node of HPC. Later the project is configured to be solved by “Domain Decomposition” method. This is recommended for HPC configuration. Also, the Memory of each machine in Cloud is increased to 224GB. Following tables lists the results for first 2 adaptive passed using Domain decomposition method. Following figure shows the comparison between Direct Solver vs Domain Decomposition. Note: As the iteration count increases, the number of elements to be solved also increase. Hence, time required to solve those elements is more for higher iteration count. The effectiveness of HPC machines will be better for higher number of iterations. Using 8 CPU cores, there was an error in 6th Adaptive pass. It was due to insufficient distributed memory. The effect of HPC is significant as the adaptive pass count increases. Below table shows the results of completely converged solution. As shown in table, 8 CPU core machine could not solve the problem beyond 5th pass. It was due to insufficient memory. Figure 2 compares two HPC configurations (8 cores vs 128 cores) at various stages of the solution. Cloud computing helped to dynamically increase size of Memory and number of CPU cores with very low turnaround time. Memory size of 112GB per machine is not sufficient to solve this problem. The cloud machines were “re-configured” to use 224GB of memory within few minutes. It could not have been possible with physical machines in the labs. The number of machines are dynamically changed based on number of CPU requirements. E.g. earlier experiments were done on 8 CPU cores and then they were executed on 128 CPU cores. The solution of problem did not even start with 1 CPU core. The solution started with 8 CPU cores. But, error occurred at later passes due to insufficient memory. The problem could be solved successfully with 128 CPU cores. The performance of 128 CPU cores is far better than 8 CPU cores. The effect of higher number of CPU cores is predominant for higher number of passes. E.g. 8 CPU cores took almost 55 minutes to execute 5th But, 128 CPU cores required less than 4 minutes to execute 5th Pass. ‘Domain Decomposition solution’ is recommended over ‘Direct Solver’ for HPC configuration.